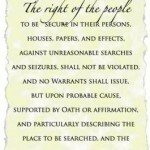 Part of the Bill of Rights, the Fourth Amendment to the United States Constitution prohibits government searches or seizures without a warrant issued by a disinterested magistrate. The Fourth Amendment protects the right to have government stay out of a person’s home and property without prior approval by a judge. If the judge has found there is probable cause to conduct a search the judge will authorize the search by issuing a warrant. Without a warrant, generally, the search or seizure of a person or his property by government agents is illegal. 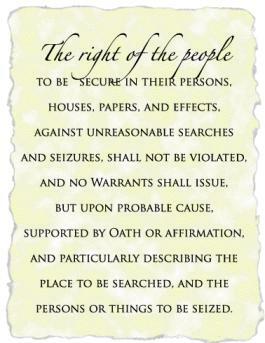 The Fourth Amendment announces the right to be free from unreasonable searches and seizures, but the manner of enforcing that right is not specified. If a criminal prosecution results from a government Fourth Amendment violation the Supreme Court has settled on a single method to make the right real. Evidence obtained as a result of a Fourth Amendment violation may not be presented at a trial. The evidence is excluded from trial, hence the Exclusionary Rule. The goal of the exclusionary rule is to discourage law enforcement misconduct since the government will not be able to use illegally obtained evidence to obtain a conviction. The seizure of property without a warrant by a police officer, or by someone acting as an agent of the police. There must be evidence for use in a criminal prosecution obtained or seized. There must be a connection between the illegal action and the evidence obtained. If there is an illegal action, but the action was unrelated to the collection of evidence, the state may present the evidence at trial. A defendant in a criminal case who believes evidence the state intends to use against him was illegally obtained must take action to enforce the Exclusionary Rule. This action is taken by defendant’s motion asking the court to exclude evidence obtained in violation of the Fourth Amendment. The motion provides the judge with information on the above points. If the prosecution fails to rebut the defense claim of a Fourth Amendment violation, the judge will order the evidence suppressed. This means the evidence may not be used while the prosecution is trying to prove a defendant’s guilt. The Independent Source Doctrine. When evidence is obtained by two methods, one being illegal and the other legal, the evidence will be allowed in court. The Inevitable Discovery Rule. When evidence is obtained illegally, but because of circumstances the evidence would have been found by legal means, the evidence will be allowed in court. The Good Faith Exception. If an officer obtains evidence with a warrant that he believed was properly issued then that evidence will be allowed in court even if it is later shown that there were certain technical problems with the warrant. Probable Cause/Search Incident to Arrest. When a warrantless arrest is made with probable cause and an immediate search takes place related to that arrest, the evidence can be used against the defendant. There are at least two alternatives to the exclusionary rule as mechanisms to deter illegal conduct by police officers. One is to charge police with crimes for illegally entering homes and buildings or for illegally taking someone else’s property. As a practical matter, police are members of law enforcement and criminal or even administrative sanctions against police are rare. Such official sanctions are imposed only in the most egregious instances of misconduct. There is the possibility of privately enforcing Fourth Amendment rights through a civil suit seeking money from the police officers that committed the violation and the agency he works for. An individual who has had his property or person illegally searched or seized has legal remedies against the police by way of a lawsuit for damages. This remedy poses difficulty as well, since most cases of police misconduct are decided by juries from the community who have been taught to respect and honor law enforcement and are likely to award damages again in only the most serious Fourth Amendment violations. The Constitution does not provide for the exclusionary rule. The Supreme Court applied the rule in Weeks v. United States in 1914 and to the states in Mapp v. Ohio in 1961. While the rule is controversial in that often guilty defendants are freed as a result of its application, the intent of the rule is to protect all citizens from illegal government activity. It is an attempt to balance the competing interests of protecting citizens from crime, and protecting citizens from the government. Seizure of a person is an arrest. There are long standing historical exceptions to the “warrant requirement” regarding an arrest, built around the idea of “probable cause”. In modern times, most arrests take place without a warrant, making the “exception” in reality the rule. Absent one of the exceptions discussed, the seizure of someone’s property without a warrant is considered “unreasonable”. This also includes other evidence found based on the original Fourth Amendment violation. For example, if a person’s suitcase were illegally seized, anything found in the suitcase is also excluded. This is referred to as the “fruit of the poisonous tree.” Violation of Fifth and Sixth Amendment rights may also cause evidence to be excluded. The Miranda Warnings exist to prevent such violations. This is referred to as a “Motion to Suppress”. This search is limited to the person arrested and the area immediately within his control. The principle reason this is allowed without a warrant is for the safety of the arresting officer. Police officers acting within their authority have a “qualified immunity” from lawsuits as well. This provides them significant legal protections from lawsuits. However, when an officer acts beyond his authority a citizen may collect damages for injuries such as battery, false imprisonment or malicious prosecution. Violations of a citizen’s rights are referred to as a “constitutional tort”. The agency employing the officer may be liable to the citizen for damages as well. Often these types of cases fall under a federal provision found in 42 USC Section 1983 and are referred to as “deprivation of civil rights under color of law”.